We race at Cransley from the first Saturday in March until the last Sunday in November and on Tuesday evenings from the first Tuesday in April to the last Tuesday in August (see calendar for race series). Depending on your type of boat you sail you are given a PY number (called a handicap). We use a programme called Sailwaive where the race results are put into the programme together with the boat handicap and the results are worked out for us. Results are published weekly on the website and posted on the noticeboard at the club. The start is most important. Too many novices keep out of the way are at the back of the fleet from the start. Try to go over the line within 30 seconds of the start. 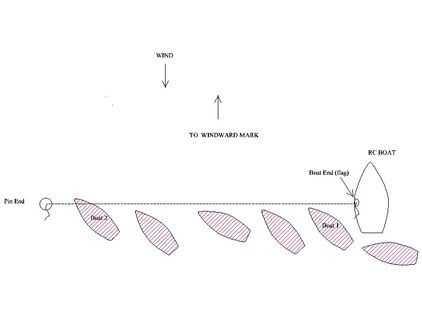 Aim to approach the first mark on a starboard tack. Other boats have no rights to come in from the other direction. Don’t be put off by all the rules, the most important one is that if a collision is imminent both boats have to keep clear regardless who is in the wrong or right. I’d like to think we are a friendly club that encourages novices to race, so if you feel daunted please let the Commodore know. Abit of healthy shouting at a mark is normal, don’t be upset! Get a buddy. The best way to improve is to talk things through with a more experienced sailor. Top Tip: Have a go – your sailing skills will develop far faster by sailing a specific course rather than just cruising around, even if you come last in every race for the first few times. Even not coming last is a major first milestone.